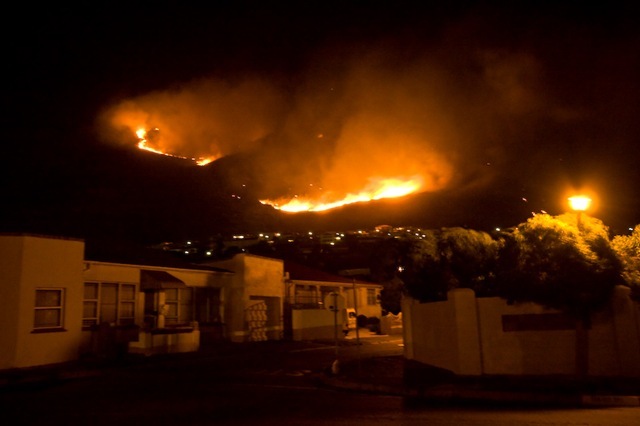 When I woke yesterday I saw that there was a big fire over the mountains in the Overberg and as the day went on it seemed to be moving further away. Last night I was away from my computer and other news sources until late. 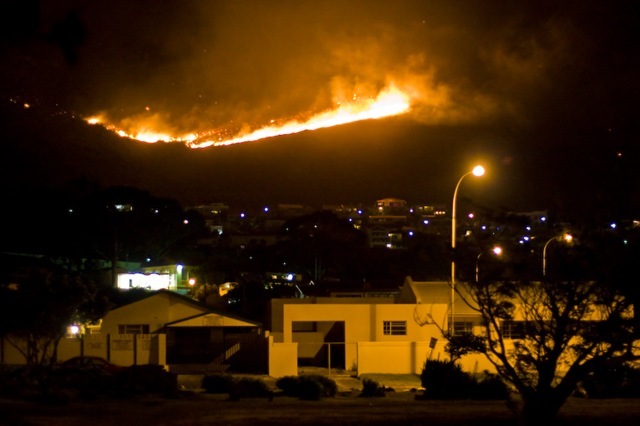 When I finally logged on, Twitter was all atweet about the fire, which had turned and had been raging out of control along the mountain side above Gordons Bay. Fromtheold had been reporting via Twitter and via photos on his blog. Just after midnight I decided to go and take a look, grabbing my camera as I headed out the door. When I got there I discovered that police had blocked access on both the upper and lower roads into Gordons Bay. I stopped before the roadblocks to take a few shots and found that the wind was blowing a gale, clearly what lead to the ferocity of the fire; this made taking photos in low light conditions difficult. After taking these shots I noticed that one of the narrower residential streets was not blocked off so I started making my way towards Bikini beach, stopping along the way to take some more photos. I eventually found my way onto the lower beach road inside the cordoned off area, from where I went to Bikini Beach. 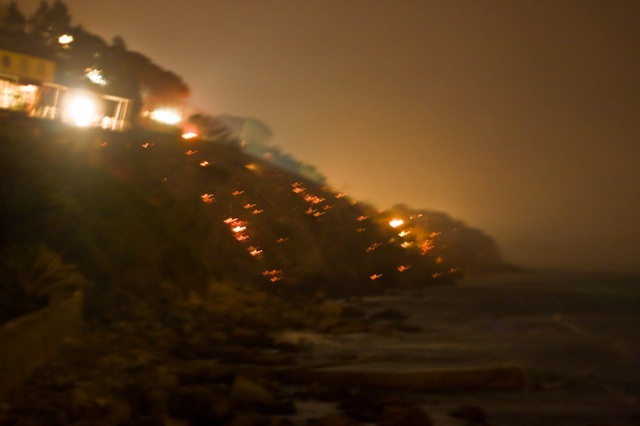 The photograph on the left below is roughly the same view that Fromtheold posted, where the fire had burned right down to the waterline. 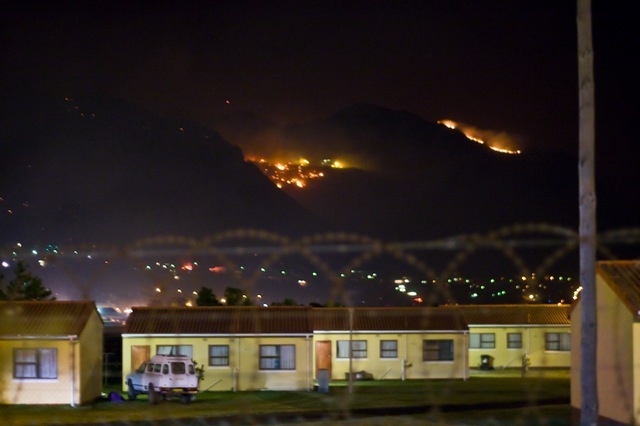 The other photo shows a few remaining hotspots on the mountain side above Bikini Beach. 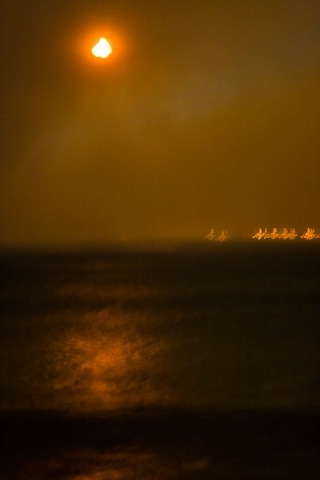 The sky was cloudless but filled with smoke, giving the moon a red glow that reflected on the water. 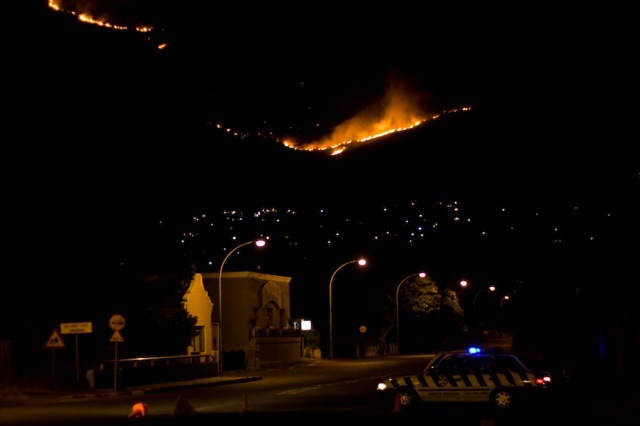 There were still many flashing red lights from fire trucks along the mountain side and with access being restricted, darkness hiding the costs of the fire and the wind making photography difficult, I headed home; but will return later today to see what daylight reveals. 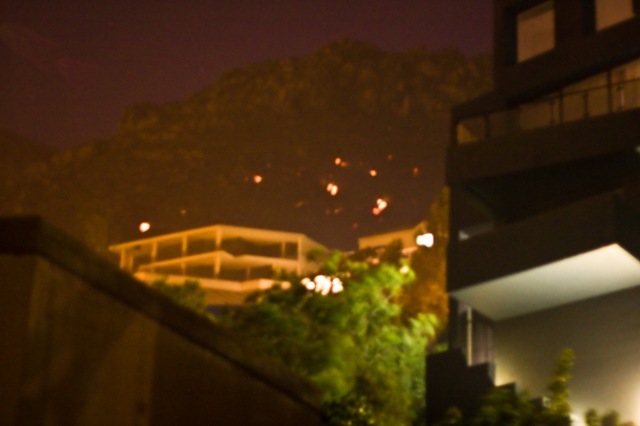 This entry was posted in Photos, Thoughts and tagged fire, Gordons Bay, night. Bookmark the permalink. Hectic!! I must say there was a lot more news on Twitter than anywhere else last night about this fire. now you just need to head off to Cape Point with that camera!